John Paul Strain Hand Signed and Numbered Limited Edition:"The Christmas Gift"
Size: 19 1/2" x 25" - Additional sizes and mediums will be listed for selection from the Drop down box. 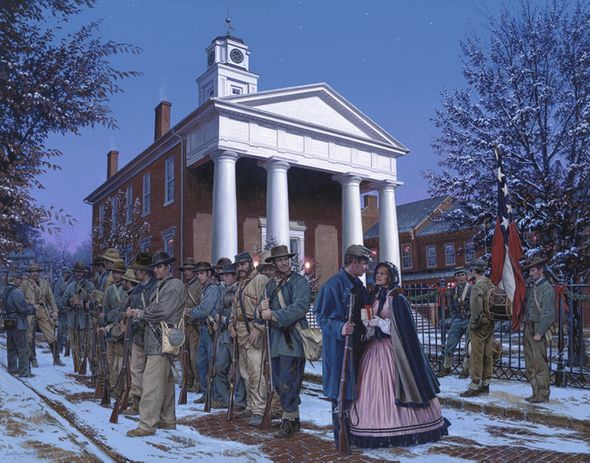 About the Art: Time was short as final preparations were underway for General Thomas J. Jackson's famous Stonewall Brigade. Jackson had received orders from General Robert E. Lee to move his corps east from the Shenandoah towards the Rappahannock River. The Federal army under the command of General Burnside was gathering in great numbers across the Rappahannock River at Fredericksburg in an attempt to sweep around Lee's eastern flank and attack Richmond.